Below you will find all of our wonderful, adoptable dogs! We are a foster-based rescue; this means that all dogs are cared for in the homes of our volunteers. **We do not have an adoption center for dogs. ** If you are interested in meeting or adopting a particular pet, please review our adoption policies and fill out a non-obligatory adoption application by clicking here. Applicants approved by the foster home will be contacted to arrange a meet and greet. Contact emails are also listed in each animal’s biography; for specific questions regarding an adoptable pet, please feel free to reach out to the contact listed. Fosters are volunteers, so kindly allow up to 48 hours for a response. 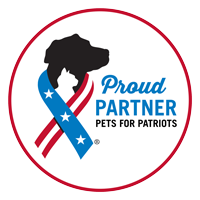 Dogs two years of age or older, over 40 pounds, and/or with special needs qualify for the Pets for Patriots discount for approved veterans. Full information about their program can be found here.